The state of Nevada is truly a study in contrast from the stark desert landscape to the breathtaking peaks of many mountains. The desert especially affords many outdoors adventures and sites you may not find anywhere else. Pack up for a true adventure when you explore our top 15 picks for the best camping spots in Nevada. This is the place to go to explore the beauty of the desert and some pretty amazing rock formations. The trails lead to some unique natural clay based formations and the caves give you the feeling of traveling back in time. The camp ground and the facilities are well maintained. This is an area with enough amenities to be family friendly without taking away from the natural wonders. Enjoy this up close view of the beautiful desert and how nature crafts out the rock formations over time. Red Rock Canyon is known for the fire of the desert landscape and will surely not disappoint. The flaming red of the rocks is what many picture when they think of the Nevada desert and this is basic camping at it's best. It is a back to nature approach without many extras so it may be a bit more than some families want but for true nature lovers worth the adventure. The views, desert wildlife and the pictures you take home are well worth a few days without traditional campground amenities like showers or running water. This campground combines the ease of camping at a KOA with the stunning beauty that can not be found many other places. The location is right where the high desert transitions into the mountains so the weather is great and the greenery is often not what one might expect. The Lehman Caves add to the adventure as they tie to local natives and open up to the entire basin. For those who want a little more of an adventure beyond the usual trip to Lake Mead, there is Boulder Beach. It's camping with enough access to hook-ups that RV travelers enjoy the quite break from the often busy Lake Mead area. This is a beach type area but can be very hot in the summer months so they do offer full hook ups for RV's with AC as needed. This is a rustic spot for campers ready to explore Mt. Charleston, and because it is both remote and small in size it is suggested campers make reservations. The availability often changes to only day use if conditions are not safe for over nights so calling the location is the best bet to fully enjoy the experience. The woodsy feel is something many may not expect from Nevada which adds to the adventure. This spot is great for hunters and fishers since you can hunt both deer and elk (in season) and fish a short distance from the small camping area. It is remote which gives campers the bonus of being away from everything but this also means the area can become not accessible during the winter months. Surrounded by Juniper trees this spot is worth the trek just for the fresh air and smell. If you are looking for just the right balance of nature and technology like free Wi-Fi this RV camping haven is just the thing. The camping at Angel Lake are a bit more mild than the high desert so its more welcoming for families and the pull through RV sites at this park are easy to use. The area is family oriented and a fun glimpse into the old west without the worry of the high desert heat. The Lamiolle Canyon has some pretty amazing untouched landscapes to be explored just outside of the campground. This seasonal camping area is only 40 miles from Las Vegas and great for families looking for something a bit different for their next visit to Las Vegas. Seeing the desert via horseback is one of several once in a lifetime opportunities you can find here. With over 60 miles of trails between the Mojave Desert and the Spring Mountains, this is a true picture of the contrast that is Nevada. The rock formations of red sandstone are what this area is known for as Nevada's oldest and largest state park. This is the spot to explore what most people think of when they picture the high desert of Nevada. The natural formations date back millions of years and will not disappoint. While this camping is open year round summers can reach 120 degrees and winters below freezing so be aware of current weather. 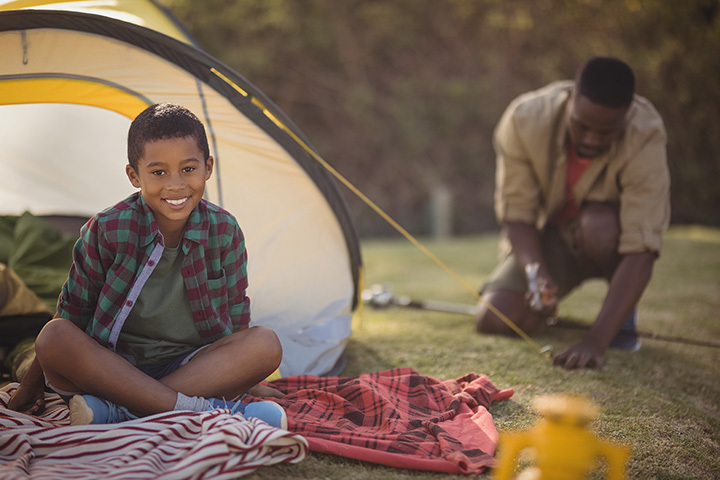 While many enjoy the idea of camping, families with young children often appreciate the flexibility of a cabin or cottage. Walker River is the place to see the beauty of Nevada via a cozy cabin. Smith Valley is a breathtaking backdrop for this trip and offers campers adventures via a float trips. Beyond the cabins there are also spaces for more traditional campers and RVS also. They also offer a wide range of ATV trails to explore the desert landscape or the valley floor. Ready to pack your water skis for the next trip to Nevada? This picturesque oasis in the desert offers the adventure of water-skiing in the warm desert air. This is a popular spot with locals because it does offer something a little different for the area while being fairly easy to access. The 72 miles of shoreline is also worth exploring. Fishing is another treat many locals enjoy here. For families with dinosaur lovers, this is a true adventure. You can explore real fossils here as well as hands on remains of old ghost mining towns. The camping is peaceful in the desert landscape but the fossils are unique to this park. The fossils date back to ancient marine mammals and are great starts to explore further ancient history. This state park is among the states newest so for many it is still yet to be discovered. Its located at the southern tip of the state with sweeping river views and access to a mild climate that supports water activities like boating, fishing and swimming. It's location is not only gorgeous but a short distance from the developing city of Laughlin so families can also enjoy a break from camping at the local casinos or even an outlet mall. A true hidden gem in Douglas County, Topaz Lake sits just inside the Nevada border with California. The lake is welcoming for those wanting to fish, swim and boat. The area offers a few well developed RV spaces but the focus is primitive camping with many more dry spaces. This is a tent campers haven with a waterfront view. This well-stocked reservoir is a rainbow trout fisher's dream. The warm desert climate mixed with enough valley greenery to make spring amazing offers a nice backdrop for fishing trips to take advantage of the fish that are seasonally replenished for visitors. The area is also known for being the location of some pretty significant ancient artifacts including Fremont pottery which can be explored via the visitor station as well.